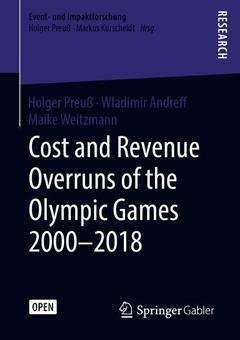 In this open access book the cost and revenue overruns of Olympic Games from Sydney 2000 to PyeongChang 2018 from eight years before the Games to Games?time are investigated to provide a base for future host cities. The authors evaluated the development of expenditure and revenues of the organizing committees to operate the event, and the investment of taxpayers? money for Olympic venues (non?OCOG budget). The study is based on data collected worldwide and is currently the most advanced study on cost and revenue changes of Olympic Games. Cost and Revenue Overruns of Olympic Organizing Committees.- Cost Overruns of Olympic Sport Venues.- Reflection on Reasons That Cause Cost and Revenue Overruns. Prof. Dr. Holger Preuß is Professor of sport economics and sport sociology at Johannes Gutenberg-University, Mainz, (Germany). Prof. Dr. Wladimir Andreff is Professor Emeritus at Paris I Panthéon Sorbonne (France). Maike Weitzmann is a PhD student at Johannes Gutenberg-University, Mainz (Germany).